More sketches from over a month ago! 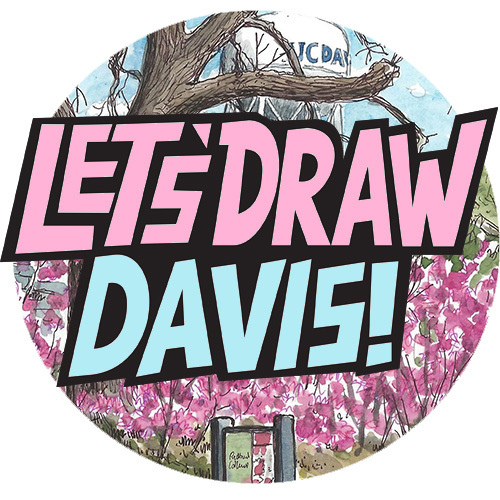 On Saturday November 12th we held another “Let’s Draw Davis” sketchcrawl on the UC Davis campus, this time at Vanderhoef Quad, named for the late Chancellor Larry Vanderhoef, location of the brand new Manetti Shrem Museum of Art, which was opening that weekend (more on that later, many sketches to post…). 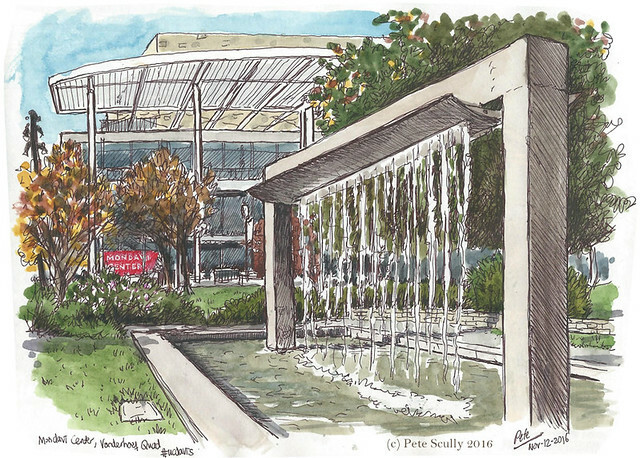 Several of us met up in the middle of the Quad and started sketching the scenery, the lovely autumnal leaves and bright November sunshine, the modern campus buildings lining the edges. 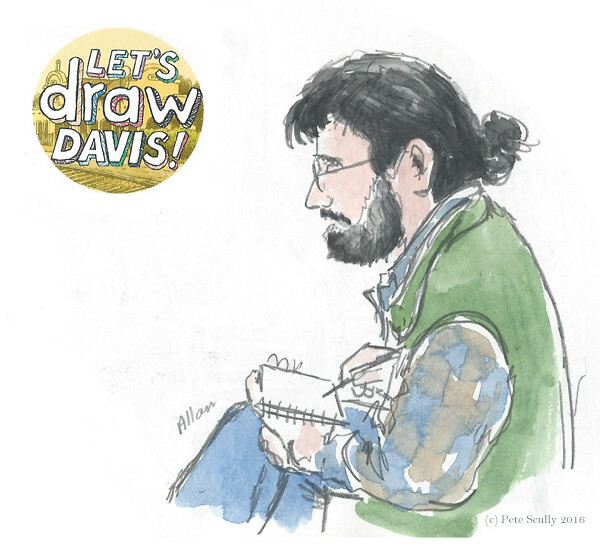 Above is Davis sketchcrawl regular (and person I have probably sketched the most!) Allan Hollander, who I couldn’t resist sketching again. Above is the Mondavi Center, an amazing performance space, with the fountains of the Vanderhoef Quad in the foreground. I actually won a t-shirt for this sketch, they sent it to me, it’s nice. 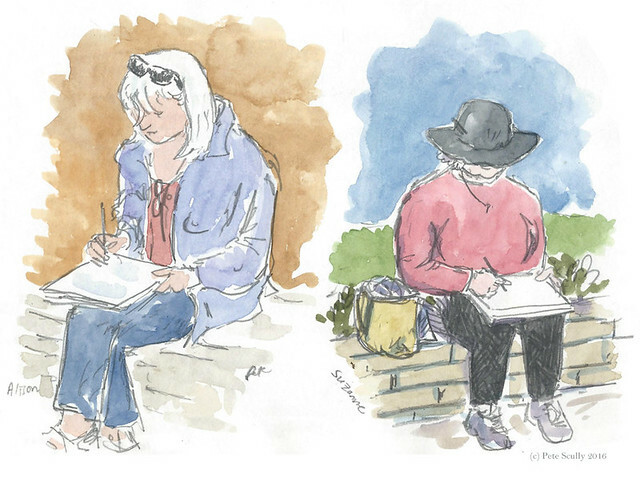 Below, also longtime Davis sketcher and fellow British-accenter Alison Kent sketches away, with another sketcher Suzanne sketching beneath a big hat. someone actually asked me once for a good tip on drawing faces when sketching people in public, often a tricky subject, and I said “make sure they are wearing a hat that covers their face, so you can get around that” and clearly I wasn’t really joking! And below is a large panorama of the Manetti Shrem Museum of Art itself! I will likely post this sketch again in the next post about the museum, or perhaps in an upcoming post where I display all my sketches of it from first construction onwards, but the building is finally finished and open! On this day, the day before the Grand Opening, they were having special opening events throughout the day – at this time, there was a special event just for faculty. That evening they were to have the ‘Director’s Debut’, an event for donors and artists (including me!! I’ll post about that next, it was fun), then another late-night event for the students. The colourful chains around the edge are there for the opening event, made by local people to be formally cut to open the museum. I had never two-page-spreaded this building before (that’s a new verb, that), given it the old panoramization treatment (another new word), so here it is. Not easy to draw over two pages with its unusual curving roof but I gave it a good old go.